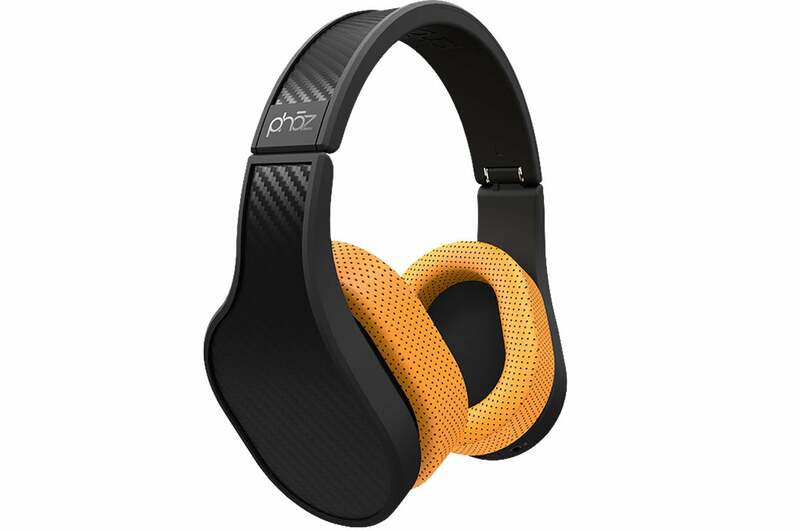 You might recall Phaz’s multi-tasking Model P2 headphones from CES 2015. Well, those sleek carbon-fiber babies—which feature a built-in battery pack for recharging your phone on the go—are finally ready for real-world testing. I took the $250 P2s for a spin this past week, and while they’re not bad, they’re also not perfect. Yes, the built-in 1200mAh battery is convenient (assuming you don’t mind multiple cords dangling from your ears), but it’s easy to tell that Phaz is a newcomer to the audio market. The shiny, three-piece carbon fiber frame is relatively lightweight and sturdy, and it folds to allow the headphones to be easily packed away in the neoprene carrying case that comes in the box. The ear cups on my review unit are perforated black foam and fit comfortably over my ears. 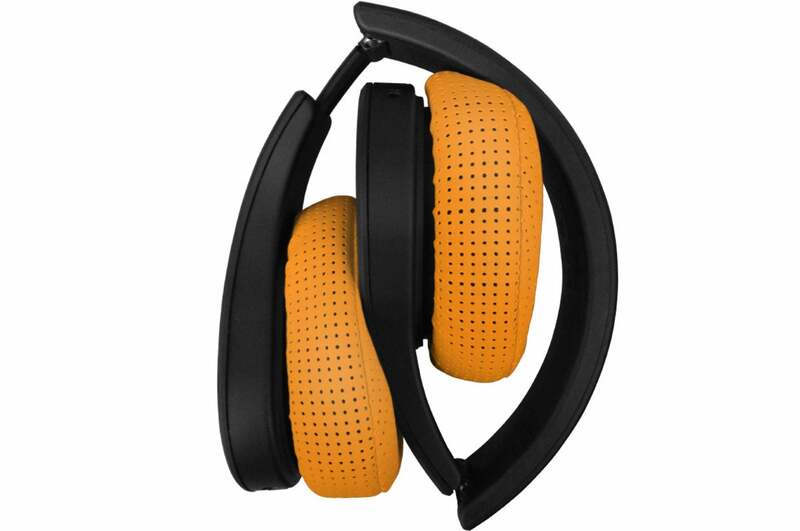 (Ear cups are available in bright orange, white, green, black, and purple; replacement cups cost $30 a pair.) The headband has a no-slip rubber lining and very little (zero) padding, which some people might find uncomfortable for long listening sessions. I found thePhaz P2 heaphones to be comfortable to wear, despite the absence of padding on the headband. There’s a power button under the right ear cup for switching on the P2s’ HD audio function, a micro USB port for charging the headphones, and a second headphone jack for sharing—plug a second pair of headphones into this jack and you can groove with a friend. A button under the left ear cup turns on the P2s’ active bass booster (HD audio must also be enabled for this feature to work), a USB port for charging your phone, and a line-in port for your audio cord (Phaz provides one that has a microphone and an Apple-type three-button remote). Whether you like the P2s’ design is a matter of personal preference; some will find the carbon fiber to be too shiny and fingerprint-prone. The P2s are relatively light at 10.7 ounces considering they have a built-in 1200mAh battery, and they’re comfortable to wear. Audio-wise, the P2s offer good—but not jaw-dropping or even great—sound quality. I found that the mid-range overpowering and the highs too bright, which made for an exhausting listening experience after a while. Enabling the HD audio and active bass boost offers only a small improvement in sound quality, but a significant boost in volume. I couldn’t go past half-volume on my iPhone 6 without feeling blasted. The P2s don’t offer active noise cancellation, the circumaural foam ear cups are very good at blocking out ambient noise. But you’re not really buying these for sound quality, are you? The P2s have a built-in 1200mAh battery, which powers both the HD audio/active bass boost and your phone, but both not at the same time. Plug your phone into the P2’s USB port and HD audio/active bass boost will be automatically disabled, though you will still be able to listen to your music, just without HD audio or that added 15db of bass kick. The P2s come with a micro USB cable that will work with your Android phone, but iPhone users will need to supply their own lightning cable. The P2s fold for easy storage and travel. Hauling around multiple cables is sure to get annoying (although Phaz does supply a cool-looking silicone cable case), especially if you need to carry the audio cable, micro USB cable (for charging the headphones), and a lightning cable. Plus, plugging your phone in and listening to audio at the same time gets awkward pretty quickly if you have a phone where the headphone jack and charging port aren’t near each other. Should you be wearing them? Phaz’s new headphones are a good effort, but they’re not quite there yet. $250 is pretty expensive when you’re mostly paying for a convenient external battery pack for your phone, and you can definitely find better-quality audio in similarly priced headphones from other companies. But the P2s are unique in both looks and features, and they’re very comfortable despite having very little headband padding. And if you’re not a bass-hound like myself, you might even appreciate the exaggerated mids. But I’ll wait for version 2.0. 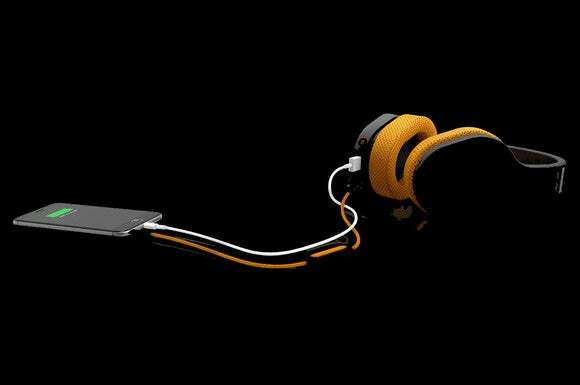 Some will consider wearing a second battery for charging your phone preferable to carrying one, but the Phaz P2 headphones don't sound good enough to justify their price tag.